A new play by Dorothy Schwarz, with Cleo Sylvestre, Patti Holloway and Kelda Holmes. A hospice. Sara, confined to bed, relives episodes from her past as she gazes into the mirror in her room. But how reliable are these ‘ghosts’? Her only visitor is her daughter Megan, a documentary film maker — but what are her motives? Based on her competition winning novella, Dorothy Schwarz explores the changing nature of family relationships and the subjectivity of truth. Camden Fringe Festival at the Etcetera Theatre, Camden Town, August 2014. Dorothy is currently Tutor in Creative Writing at the Adult Education College in Colchester. She has worked and travelled extensively including teaching in Lagos, Jerusalem, New Delhi and Paris. She has written short stories, children’s novels and is also active as a freelance journalist and contributor to The Guardian and The Times. Her previous play Bathsheba’s Ghosts was performed at Colchester’s Mercury Theatre. Fade to Blackout is her third play. Off the Page! 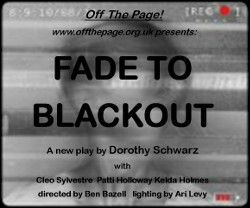 would like to thank Norma Cohen, Shenagh Govan and Joe Shefer for their participation in Fade to Blackout.